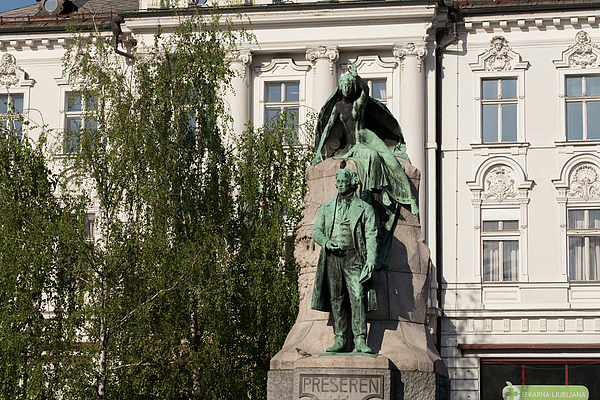 There are no comments for The Statue Of France Preseren And His Muse. Click here to post the first comment. 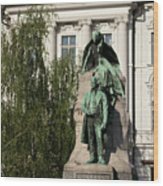 The Prešeren Monument in Ljubljana, also Prešeren Statue in Ljubljana, is a late Historicist bronze statue of the Slovene national poet France Prešeren in Ljubljana, the capital of Slovenia. It stands in the eastern side of Prešeren Square, in front of the Central Pharmacy Building in Ljubljana, the capital of Slovenia. 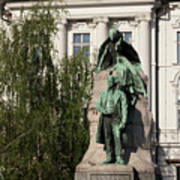 It is among the best-known Slovenian monuments. Ivan Zajec started his work in the studio of Hans Makart in Vienna. The model for Prešeren was Prešeren's portrait by Goldenstein, and he depicted the suit of Prešeren after a model from 1830–1840, borrowed in a Vienna museum. The model for the muse was Olimpia Pozatti, a dancer from Trieste. 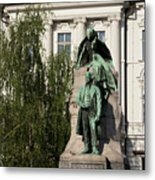 The monument of Prešeren was cast in Krupp foundry in Vienna in September 1903, and the muse was cast in the beginning of 1904. The monument was ceremonially unveiled on 10 September 1905.